Knowledge derived from direct perception, analysis, and hypothesis is by nature limited to what our senses or scientific instruments can perceive. But there’s ample reason to believe that reality includes something beyond the reach of our senses. How can we explore that realm? Or, to be more direct, do we really expect to find God with our microscopes and telescopes? 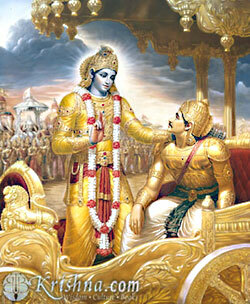 The Vedic tradition shows that hearing from authorities is the superior method. The Vedic method is to learn about the spiritual realm from sources within that realm, such as God Himself, His pure devotees in touch with Him, and His words in the scriptures. Though it is natural to be skeptical of claims of spiritual revelation, students on the Bhakti path gain an ever-deepening faith in the authenticity of the scriptures and saints of the Bhakti tradition, so pure and powerful is their message.